Then it was France. At 7am we arrived into Fort-de-France. 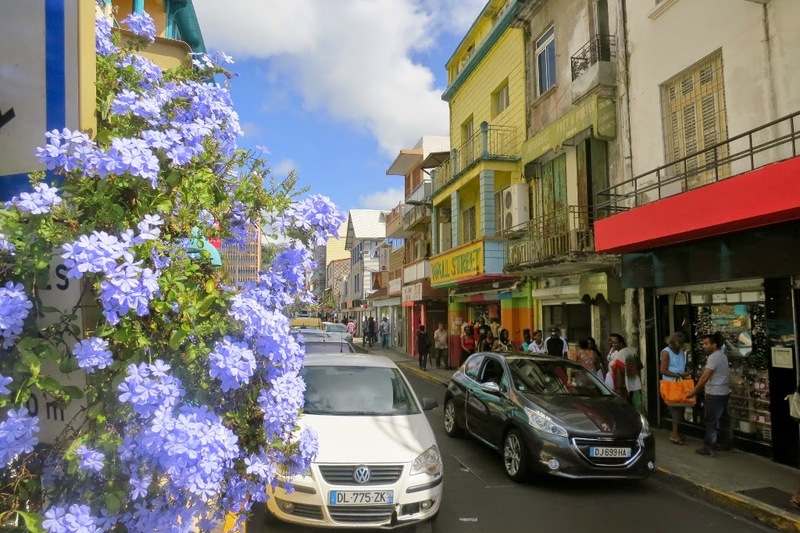 Martinique belongs France and Fort-de-France is a mini, mini, Caribbean Paris with Lafayette department store. After breakfast, we walked around the town and then to the shops and sights. The city is very different from the other Caribbean cities we have visited - but very authentic. The population 100,000 inhabitants, so not a whole little town, but the sights are concentrated in the Old Town. Back for lunch, but there was jam-packed in the Windjammer, so we took our food with down on the balcony - it gave a little extra exercise when we had to get up to fetch ice cream for dessert! There are 6 floors from our cabin on deck 8 up to the Windjammer on decks 14 and lifts are banned. We sat and read on the balcony and in the afternoon we got some sun on the sundeck. After Northstar trip we sat in Northstar Bar and had a glass of white wine. In fitness - as TV newspaper - and at 19 we went down to get a drink and dine in Chic. Shrimp for starters and lamb t-bone. We skipped dessert. Went a little round the ship before we went to bed.